Twins | The One with the Wallpaper! 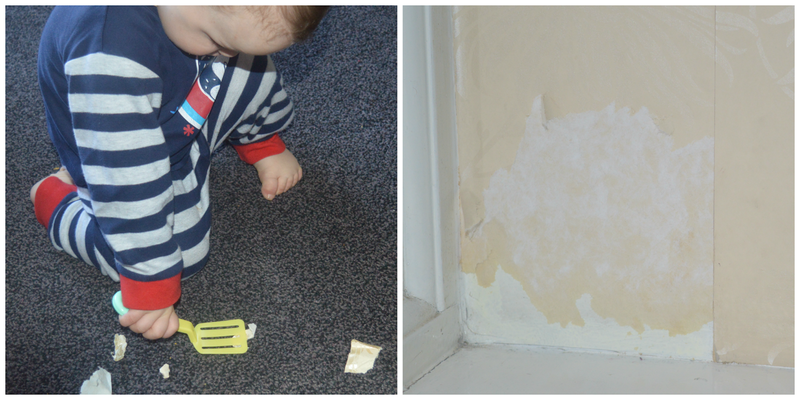 What you're seeing here is one of my delightful babies playing with the Laura Ashley wallpaper he has just pulled off my lounge wall. To add to the mix, he is using a spatula from a toy set they were both bought at the weekend, to play 'frying' it! God help meeeeeeee! When will they ever stop this nonsense? P.S. This is the second time they have attacked my wallpaper. The first time resulted in a whole panel from under the window sill being removed. Check out my Instagram account for a closer look. I've given it up as a bad job. Will have to go through the whole house again when they are older and hopefully more sensible :) Thanks for hosting - I've no doubt I'll be back with more wickedness!